The opportunity for irresponsible driving, and even accidents, is greater the longer you are on the road. Accidents happen in an instant and every extra second you are on the road increases the odds that something will go wrong. Fortunately, most of the time, things go off without a hitch, or at least without a major hitch. Individual drivers can do a lot to minimize their and other people’s risk while they are out there on the road. 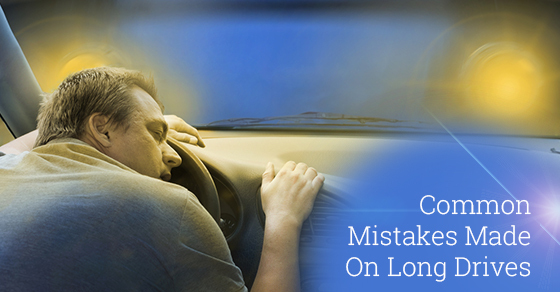 Below are some of the common mistakes made by drivers during long drives. Lack of sleep. Sleep deprivation is a universal cause of accidents, but all the more important in the context of commercial truck drivers who spend much more time on the road than your average driver. Ensuring that you are getting sufficient sleep so as to be able to safely handle your vehicle and remain alert is absolutely necessary. Overexerting oneself in order to meet unsafe schedule requirements is a recipe for disaster. Failure to follow safety guidelines and procedures. The proper handling of safety issues is something that all licensed commercial truck drivers are aware of and have had instilled in them. They wouldn’t have passed their driving tests had they not known. Unfortunately, sometimes, whether as a result of exhaustion, laziness or unsafe company policies and practices regarding delivery schedules/keeping to them means that truck drivers either ignore or have to sacrifice safety for efficiency. Falling victim to economic pressures. This holds especially true for drivers that are paid by the mile. Paying a driver by the mile incentivizes them to drive for an unhealthy period of time without getting necessary rest. This can increase the likelihood of the above mistakes because it makes their livelihood dependent on speed which is a negative in so many different respects where commercial rigs are concerned. Depowering the front brakes and improper attachment of trailers. Some drivers who own and operate their own rigs will power the front brakes down and just rely on the trailer brakes in order to minimize the costs associated with wear and tear on the front brakes and tires. A truck without front brakes is an accident waiting to happen. Sometimes drivers will also improperly attach the trailer to the truck which can greatly increase the odds of a truck jack-knifing. Most drivers are responsible and thoughtful, aware of the dangers of the road and the nature of their job. That being said, nobody is perfect 100% of the time and mistakes and oversights do happen, even to experienced and conscientious drivers. Knowing about these mistakes and keeping them in mind while you are driving will help you avoid making them, and will keep you and others on the road safe.